The Latest with David Jay: Updated Schedule! 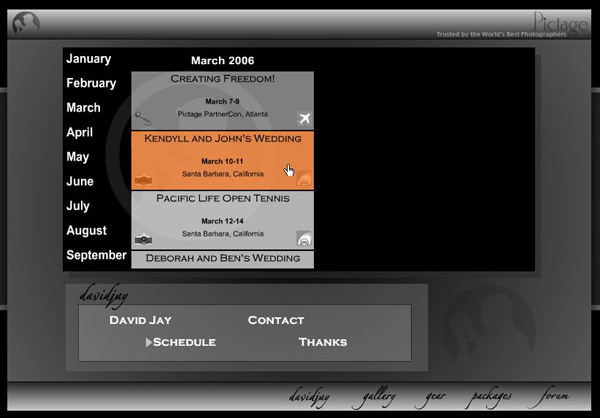 My buddy Todd always gets mad at me because he made me the sweetest website ever and I still lag in keeping it updated! Haha....but I just finished updating my schedule from the last couple of weeks and I'm gonna really try and keep on it because it's so cool! All I have to do is type in this little text file and then upload a picture and it adds in all the other stuff! I also made a little slideshow from the Atlanta PartnerCon so be sure to check that out too! ***CLICK HERE*** to check it out! ... and be sure to sign up for my monthly newsletter which you can now do right here! (just submit your address in the space to the right) LOTS of really cool stuff to share this month including a SUPER AWESOME shooting trick I've been doing that is definitely gonna get you stoked! Wow!! Those are great slideshows!! BUSY schedule!!!!! At least you won't be bored!! Nice! I'm glad you guys like it! I've been really enjoying blogging more so I figured I'd spice up the page a bit...and if you scroll to the bottom you can see that I added the OSP Map that Jim Cook made! So cool!